Central Asia was a tightly-controlled, heavily militarized region while under Soviet control. As the Cold War progressed, the Soviets made significant security investments in the region, constructing weapons plants, nuclear reactors, and biological and chemical weapons facilities in a part of the world far removed from the United States or its NATO allies. The Soviet Union also used Central Asia’s large barren areas as test sites for its nuclear weapons program. While independent since 1991, the Soviet Central Asian states confront a legacy of Soviet chemical, biological, radiological, and nuclear (CBRN) contamination. This map, developed by Philippe Rekacewicz for the UN Environment Program, shows the extent of the Soviet investment in CBRN research, development, testing, and manufacturing throughout Kazakhstan, Turkmenistan, Uzbekistan, Tajikistan, and Kyrgyzstan. Click here or on the picture above to see the full map. The map shows Kazakhstan with no fewer than five separate nuclear test sites, four of which are in proximity to major rivers such as the Irtysh and the Volga. 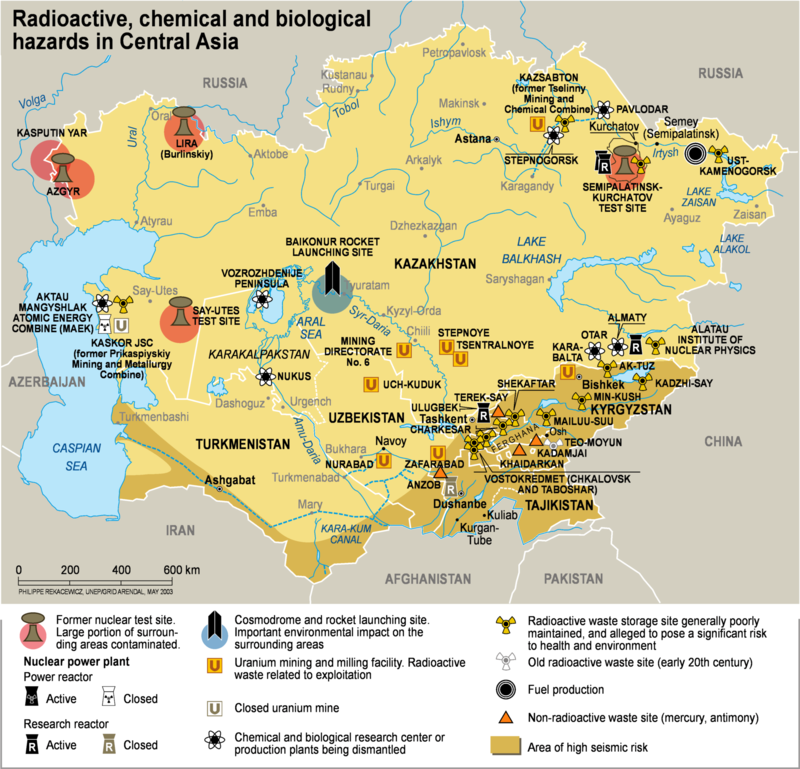 The map also shows several active uranium mining facilities across the country, and shows two chemical and biological research centers, a nuclear waste storage area, and an active research reactor in Almaty, the former national capital. Kazakhstan continues to suffer health and environmental impacts from Soviet nuclear tests, to the degree that the country has made the cause a major national and foreign policy effort. Kazakhstan is also home to the Baikonur Cosmodrome, the central research, control, and launch facility for the Soviet (now Russian) space program. To the west of Baikonur, in the middle of the shrinking Aral Sea, is Vozrozhdeniya Island, which served as a major Soviet biological weapons proving ground. Researchers there bred many strains of biological weapons, including the bubonic plague. The island was home to the world’s largest anthrax dump until 2002 when the U.S. Department of Defense organized a mission to clean up the island. Over three months, using 113 people and at a cost of $5 million, the expedition neutralized as much as 200 tons of anthrax. To the southeast, across Tajikistan, Uzbekistan’s Fergana Valley, and into Kyrgyzstan, the Soviets built a large number of nuclear waste storage facilities. These facilities are located outside of small villages with names like Ak-Tuz, Min-Kush, and Mailu-Suu. The Soviets also build several storage sites in the area for hazardous but non-nuclear materials like antimony and mercury. These facilities lie deep in the Tien-Shan mountains, which rise over the fault lines between the Indian and Eurasian tectonic plates. Any major earthquakes could rupture these storage facilities leading to widespread contamination from nuclear and other hazardous materials. Turkmenistan and Tajikistan have relatively few CBRN facilities in their territories; but Kyrgyzstan and Kazakhstan in particular continue to face daunting security and cleanup efforts stemming from old and frequently crumbling Soviet facilities. The original page for this map and its description can be found here. Thank you. As a Social Studies teacher I will use this article for Geography, Modern European History, American History, and American Government to illustrate the circumstances, problems, and heritage of the Soviet Union in this area of the world. I will also check your blog often for other articles that will help me help my students learn about the world. Thank you! Where are yur contact detailps though?